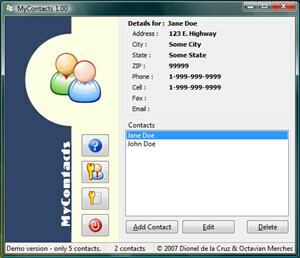 Description: MyContacts is an easy to use and excellent way to keep track of your contacts, business or personal. Simply click on 'Add Contact' to make a new entry and then click 'Save'. To edit or make changes to an existing contact either double click on the name row selection or on the details screen section of the contact. This will bring up an edit window to make changes to the current contact in view. Never again lose any contact information on scribbled pieces of paper or business cards that go lost. With MyContacts you will always be in contact with your contacts.